When I told Jerry Millhon, executive director of the Whidbey Institute and a dear friend, about my project to learn Amharic, he told me I had to meet Hanmin Liu, a wonderfully kind man who has been working with the Ethiopian community in Santa Clara County for the last few years. Hanmin graciously agreed to meet me last Thursday at his Wildflowers Institute near Chinatown. 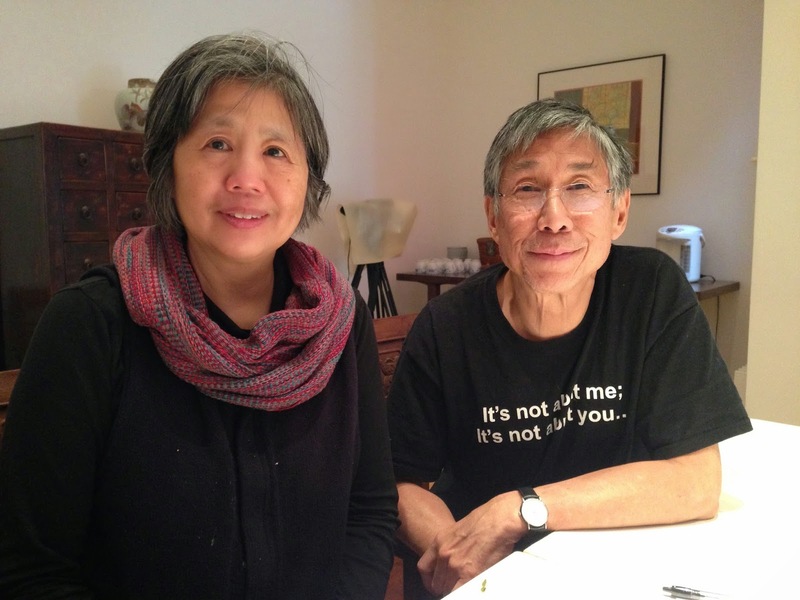 Hanmin and his wife Jennifer Mei co-founded Wildflowers Institute back in 1998 to connect philanthropists and NGOs to the informal leaders and systems of diaspora communities, with the idea of funding and promoting what actually is working at the grassroots level. One step of the Wildflowers Approach is to create maps of how the community sustains itself through informal networks. Hanmin gave me a copy of maps Wildflowers created for the Santa Clara community; these will help me tremendously as I begin to navigate the San Francisco and Oakland Ethiopian communities. I will be writing more about these informal networks as I encounter them. For now, I just want to say something about coffee. 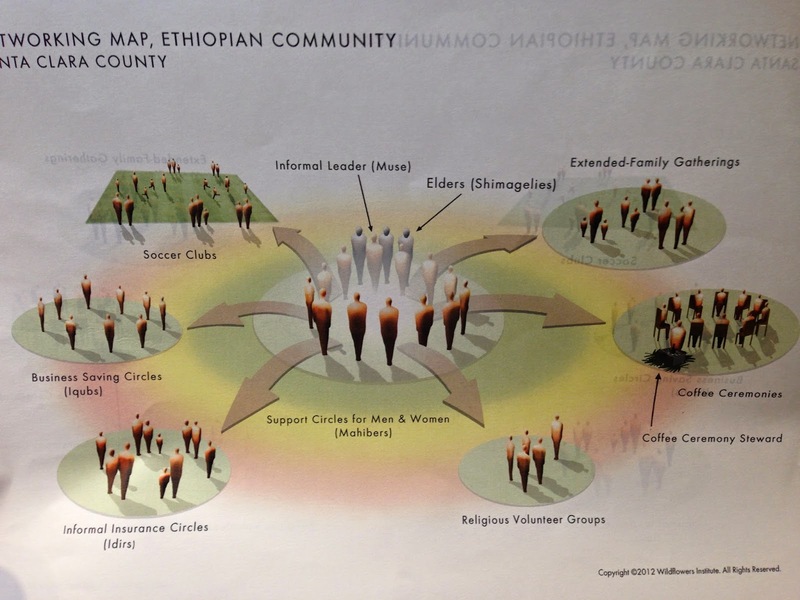 You might notice from this map that the coffee ceremony (on the right side of the page) seems to play an important role in connecting members of the Ethiopian community. I look forward to finding out more about how these ceremonies are actually used. In the meantime, I want to learn how to roast coffee at home. Hanmin told me he's been roasting coffee every morning when he wakes up. He and Jennifer use the ritual of mindful coffee preparation and consumption to check in with each other about the day's activities. Hanmin also noted that the home-roasted coffee provides him alertness without any of the agitation. (This is exciting. Maybe I won't have to drink decaffeinated coffee any more.) 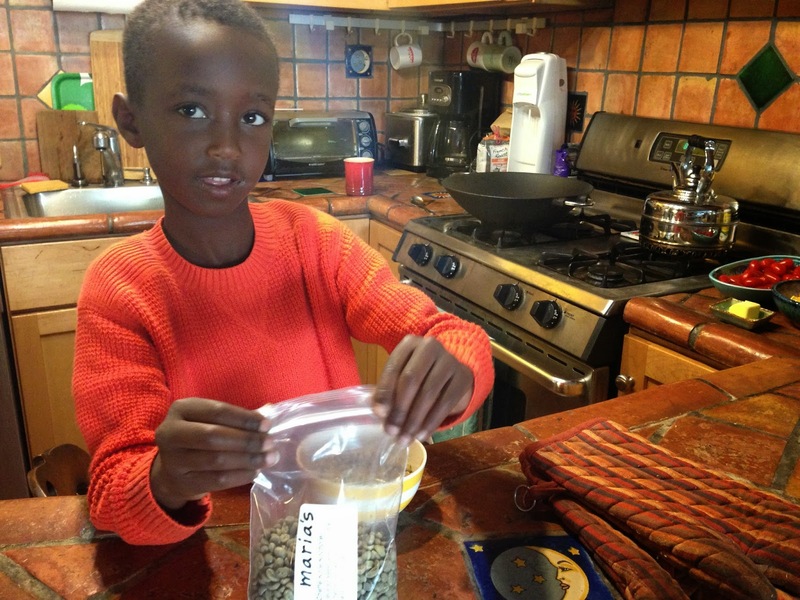 Before I left Wildflowers, Hanmin directed me to Sweet Maria's in Oakland to buy unroasted raw coffee beans. I went on Friday after my second Amharic lesson with Lulit. 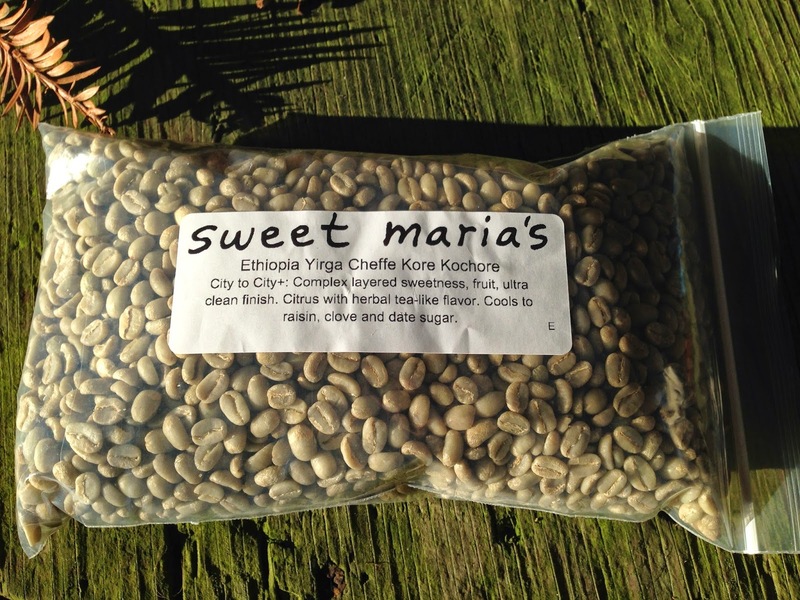 Sweet Maria's had two Ethiopian varieties. I randomly picked the first one...the one that "[c]ools to raisin, clove and date sugar." My plan was to roast the coffee with Anemo for Suzanne on Mother's Day, not only to provide Suzanne with a delicious cup of coffee, but more importantly to engage Anemo in another facet of Ethiopian culture. You can see the wok we used on the stove. Next time I may use a skillet. Anemo was game, so we put a bowlful of beans in a heated wok. When the lid was on, I shook the wok; when we took the lid off, about every minute or so, Anemo stirred. We kept the beans on for about 15 minutes. On Sweet Maria's website, the roasting instructions explain that "[y]ou want to pour the beans out of the skillet into a collander [sic] when they are a tad lighter than the color you desire, since roasting continues until beans are cool." Either this is completely false, or, what's more likely, we took the beans off the heat way too early. At any rate, they really didn't get any darker. I told Anemo the beans would turn the color of his skin. I was wrong. By this time, Suzanne had already made herself a real cup of coffee so she could endure the wait until her special cup of coffee. Anemo and I decided to go forward with our "delicate roast," and so we put the beans in the coffee grinder and then into the French press. Anemo said the coffee looked like pineapple juice. 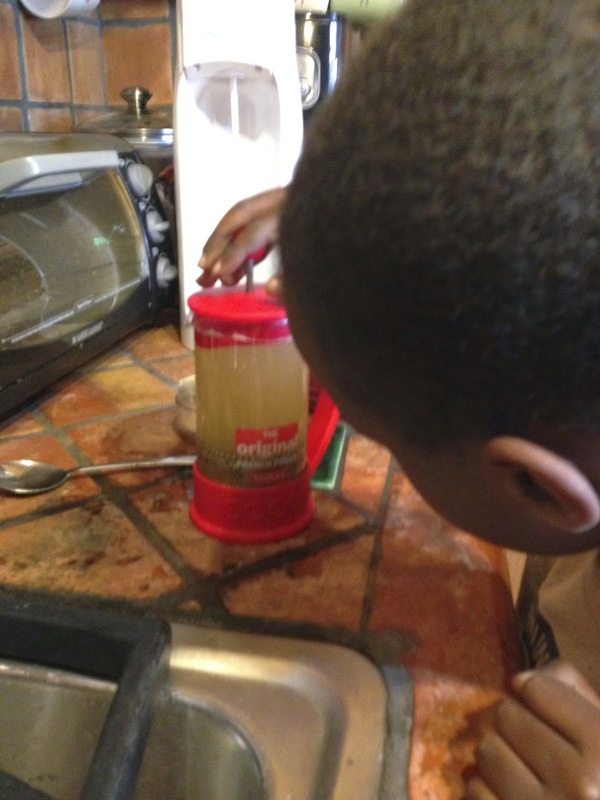 Anemo added milk and sugar to his drink. We should have done the same. What I can say from our first experience roasting coffee is that the final result was not undrinkable. It was warm and offered a vague impression of coffee. Suzanne said she could imagine hypothetically enjoying the brew while camping in the back country. 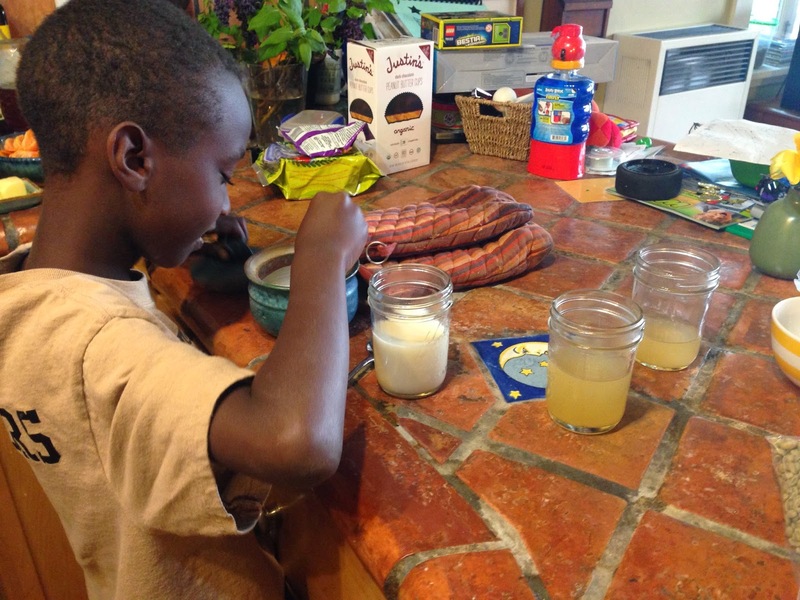 Regardless of the taste, the experiment was fun, and Suzanne did convince us that she appreciated our effort. Undoubtedly, there will be more attempts in the future to approximate real coffee. I'll end by recalling the most profound coffee ceremony I'll ever attend...the one during the "Entrustment Ceremony" when we met Anemo's young mother, Deto. Happy Mother's Day! January 31, 2009...a significant day in our lives. Popcorn is a staple at coffee ceremonies.